Project Numbat is a not profit group and its entire committee is run by volunteers. Each volunteer brings an expertise and has a passion to get things done and always follows through! We are fortunate that over the years we have attracted like mind people to assist us out in the field as we understand for some, volunteering cannot always be on a regular basis. And a photographic celebration of our volunteers! To celebrate this years World Numbat Day on Saturday 3rd November, why not join us for a delicious and intimate High Tea at the prestigious Duxton Hotel in Perth from 1-3pm. 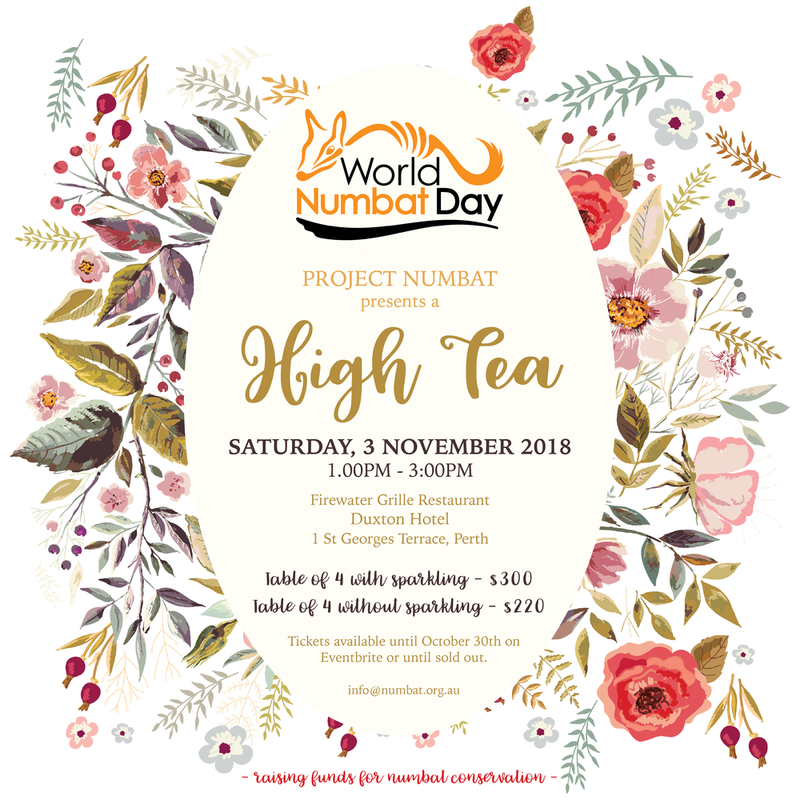 A delicious menu and range of teas will be available and Perth Zoo staff member and founder of Project Numbat Vicki Power will provide an informal presentation about the numbat. We will be selling our unique range of numbat mercahndise and will be raffling a print featuring a numbat paw print and group passes to the Perth Zoo. In case you didn't already know the Numbat has been installed! The park is not quite finished and open to the public just yet however it should not be too long now. We can't wait and we wonder what name she will be given? Our Quiz night was a great success and we were able to raise the final amount of funds for our Numbat sculpture - just over $6,000 in fact! A big thank you to all those that attended. The sculpture is now well underway and is due to be installed by mid July in the Lions Park at Williams. Raising the $46,000 could not have been achieved without support from the Williams community and its local Council. This foam version of the Numbat will now be used to create a Numbat mould. CDM - Creative Design Models are the fabricators behind this 'one off' invention which has been a dream of Project Numbat's for many years. We are counting down to our Project Numbat Quiz Night next Saturday 17 March (7pm) at the Melville Bowling Club! 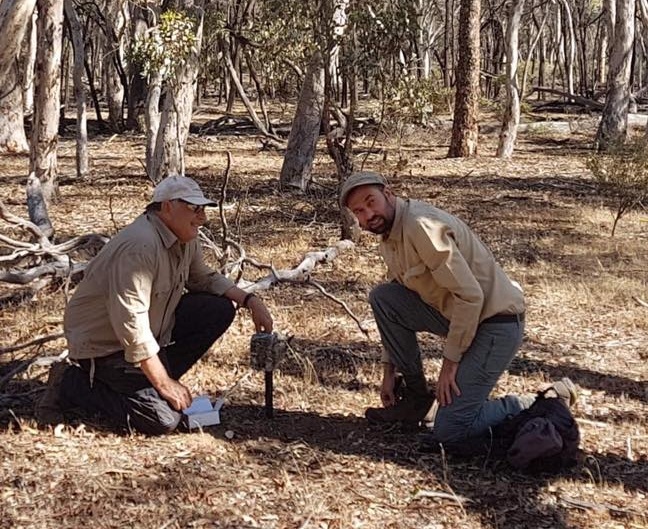 We have prepared a fun quiz night and much more, such as the auction of a unique Numbat Experience: a half day Numbat tracking tour in November with Numbat expert Dr Tony Friend. You can take up to two friends to track a collared Numbat in Dryandra. Every question you ever had about Numbats, will be answered by Dr Tony Friend. We also have a great range of items for our silent auction. Click here to read our Auction Catalogue. To book your tickets for the quiz night, please click here or email quiz@numbat.org.au for more information. Project Numbat Quiz Night in Melville! At Project Numbat we have been putting our brains to work once again for a challenging and fun Quiz Night to raise funds for the Williams Community Numbat project – that is the creation of a giant Numbat sculpture that will be installed in the Lions Park Playground in Williams. So gather a group of 6 friends and family members and come join us at the Melville Bowling Club on Saturday 17 March. Doors open at 6pm for a 7pm start. There will be a silent auction and games and great prizes to win. Our first prize is a weekend in Dunsborough at Possum House for your whole team! Tickets are $90 for a table of 6 people ($15 per person). There will be a licensed bar and you can bring your own nibbles. All proceeds on the night will go to the Williams Community Numbat – for more information on the Williams Community Numbat, please have a look at the Williams Community Numbat section on our website. To book your tickets through Eventbrite, please click here! Ever wanted to know what it is exactly Project Numbat does? We've summarised it in this short doco, which premiered at last week's World Numbat Day. Starring our current Committee Members and heaps of cute Numbats - of course! To mark this year's World Numbat Day, we look forward to welcoming you all at the Kookaburra Cinema in Mundaring on the 4th of November. The outdoor cinema will be opening especially for us before the official season commences. It is a great chance to enjoy a beautiful night out under the stars in the wonderful bushland setting. We will be screening 'Oddball', a 2015 Australian family film about an eccentric chicken farmer who trains his mischievous dog Oddball to protect a penguin sanctuary from fox attacks. The Cinema opens at 6:30pm and the movie commences at 8pm. Especially for the little ones, we will have kids' activities starting at 6.30pm. You can get tickets at the door ($15 for adults and $10 for children). The Kookaburra Cinema will donate part of the ticket sales to Project Numbat so we can continue to fund conservation activities and raise awareness. You will also have the chance to meet our mascot Nurla and to buy some exclusive Numbat merchandise. A snack bar is provided, but feel free to BYO picnic. We look forward to celebrating World Numbat Day together with you! Note: There are no EFTPOS or ATM facilities at the Kookaburra Cinema, so please bring cash for your tickets and the bar. We have uploaded a unique video of a Numbat digging and feeding on termites in its natural habitat in the Boyagin Nature Reserve. This footage must have been filmed while laying on the ground! Click here to see the video on our Numbats in the wild page or visit our YouTube channel for more Numbat videos! Project Numbat is vamping up its fundraising to reach $46,000 for the creation of a large fibreglass Numbat to feature in the future Williams Lions Playground! We have committed an additional $8,000 which now totals $14,700 towards the 'Williams Community Numbat'. Some of the funds have been raised by attending local events in Williams such as the markets. We have also approached local businesses in Williams and Narrogin for donations too. What we are really excited about is our upcoming quiz night later this year in Williams. Many local businesses have already advised of their generosity to provide gifts, hampers and vouchers for prizes and auction items. When we do reach our goal and have the Numbat feature installed we want the Williams community to say ‘I helped fund the large Numbat in our playground’ and all Western Australians to say ‘I know what a Numbat is’, because as we know, it is our State mammal emblem after all. If you live in the Williams area then please consider attending or donating to support this local project. 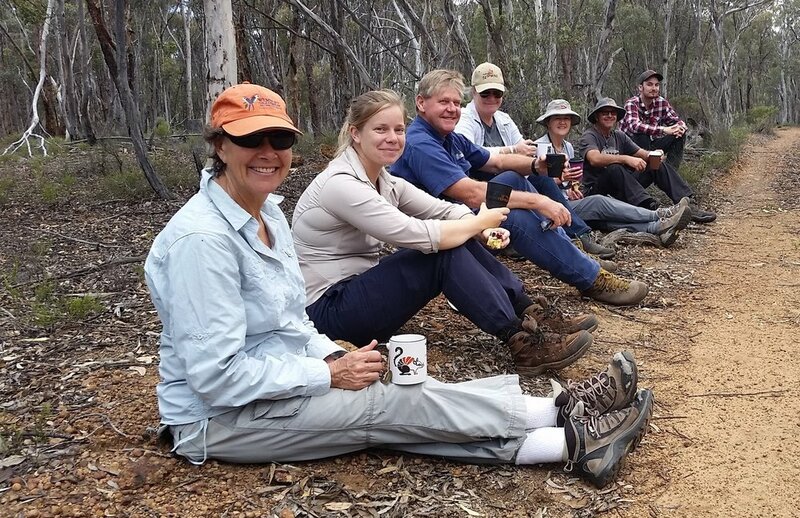 If you live further away then you can still join us, and even stay overnight at Dryandra Woodland where you may be able to spot a Numbat in the wild. Last weekend, Project Numbat assisted in rescuing a baby numbat. It was brought from Frankland River to Perth Zoo after a call from Uralla Wildlife Sanctuary. Perth Zoo has been taking excellent care of the baby numbat and it is now in a stable condition. Project Numbat president Tamara Wilkes-Jones was looking forward to a relaxed Friday evening pizza and footy night at her home in Perth with her husband Mark. A call from Uralla Wildlife Sanctuary in the South West changed everything. Next thing they were in the car for a 4-hour drive down south, armed with a hot water bottle, a box and some towels. Because that’s what you do when you want to save endangered wildlife from extinction. Earlier that day, volunteers from Uralla Wildlife Sanctuary had contacted the Wildlife Helpline asking them what the best procedure was to deal with a baby numbat. They had picked the baby numbat up in Frankland River, after the young one had become separated from his mother near Perup, in the numbat heartland. Their request was answered with a surprised reaction: “Are you sure it is a numbat?” With only 1,000 numbats left in the wild, the finding of the baby numbat came as a big surprise to all involved. Project Numbat's Annual General Meeting will take place on Tuesday 20th September 2016, 6.00 pm at the Perth Zoo. There are less than 1,000 Numbats remaining in the wild. We are seeking new committee members to contribute to the awareness and protection of our iconic and uniquely Western Australian species - the Numbat. Project Numbat has been in operation for over 10 years and has contributed approximately $70,000 towards conservation and awareness. Our vision is: Community awareness and involvement in the conservation of our unique mammal emblem. We have many exciting projects that are either underway or waiting for the right opportunity. We are seeking members to become part of the committee and we believe that everyone has something to offer. We all bring our own expertise, time and of course a passion for the Numbat. As a committee member you will need to hold a current membership, be available to attend monthly meetings held on the 3rd Tuesday of each month at South Perth from 5.30pm and access to emails to keep up to date and provide input. At the AGM, all positions will become vacant on the 20th September 2016. We will have four executive positions available; President, Vice President, Treasurer and Secretary. We also have five committee positions available and as part of the team you may choose to become involved in any of the following: organise attendance at events / fundraisers, write our quarterly newsletter, hold Numbat presentations, purchase and distribute merchandise, manage our website and social media, develop marketing materials, manage memberships, chair meetings, assist our paid accountant, develop new projects and collaborations, take meeting minutes, create videos and be updated on the recovery and survival of the numbat. Our prime stakeholders include: Department of Parks and Wildlife, Australian Wildlife Conservancy and the Perth Zoo. If you would like to volunteer and work with like-minded people while contributing to the long term awareness and protection of States mammal emblem then please consider joining our active committee. Spring is in the air! Around this time of year, inquisitive numbat young start leaving the nest and exploring the wondrous world away from the burrow. Meanwhile here at Project Numbat, we have put our most inquisitive brains to work to devise a challenging and fun Quiz Night to celebrate this year’s World Numbat Day on Saturday 5th of November. So gather a group of 8 friends and family members, and come join us for the World Numbat Day Quiz Night at Melville Bowling Club. Doors open at 6pm for a 7pm start. There will be a silent auction and games, and great prizes to win. How about a weekend at Dryandra Village, in the heart of numbat country, for your whole team? Tickets are $20 (+$1 ticket fee) per person. We’ll provide a licensed bar and you can bring your own nibbles. All proceeds of the night will go to numbat conservation and awareness projects. Project Numbat is seeking sponsorship from individuals and organisations in support of a Quiz Night to celebrate World Numbat Day this year on November 5th. A range of sponsorship categories are available that include the giving of funds and prizes for our silent auction. For more information click here to view in full what sponsorship is available. Your contribution will be recognised and promoted by Project Numbat and you will be able tell your customers about how you have supported us to raise funds and awareness of the Numbat. We have a growing supporter base, over 4,000 social media followers and to date have contributed over $70,000 to Numbat conservation activities. One of our sponsorship opportunities even includes an invitation to attend a Numbat release in December this year. It has always been a dream of Project Numbat to see a large Numbat installed in a suitable spot, to attract maximal attention and help raise awareness about the Numbat's plight. We have found this location and it's in the middle of Numbat country! The Shire of Williams will be re-developing its Lions Park Playground and a fibreglass Numbat measuring 3m long and 1m high will find its home here. To help make this come true, Project Numbat is asking the Williams Community and public for their support to raise the necessary $46,000 for the production of this Numbat by the end of December 2017. Meet Project Numbat at the Williams Gateway Expo! For the first time, Project Numbat will be attending the Williams Gateway Expo this Saturday 16th April to raise Numbat awareness. Williams is located 160 km south of Perth and being close to Dryandra Woodland -the home of the numbat- what a fitting place for us to be! We will have a stall and will be selling our unique Numbat merchandise and Nurla our mascot will no doubt be posing for many photos. Please come down and see us, it is a 2 hour drive from Perth. The Williams Gateway Expo on Saturday 16th April runs from 11 am to 5 pm and is held at the Town Oval on the Albany Highway. For more information about the Expo, please visit http://www.williams.wa.au/expo/ or contact Project Numbat at info@numbat.org.au. Every year in March, all kikki.K stores across Australia host a Charity Event to support a good cause. This year, kikki.K Subiaco has decided to help raise funds for Project Numbat. The Project Numbat Charity Event will be hosted at kikki.K Subiaco, on 19 Rokeby Road, on Thursday 17 March from 4:30pm till 7:30pm. Kikki.K will donate 20% of all purchases made during the event to Project Numbat. Volunteers from Project Numbat will be at the store to inform the public about the Numbat and about how you can help protect them. So this is a great time to get your stationery supplies for the new academic year sorted, or hunt down some great gifts for upcoming birthdays and other celebrations! For more information, please contact Project Numbat at info@numbat.org.au or call kikki.K Subiaco on 6280 0017.